The propane-fueled apparatus comes from America’s chile capitol, New Mexico — home of New Mexico State University’s Chile Pepper Institute. 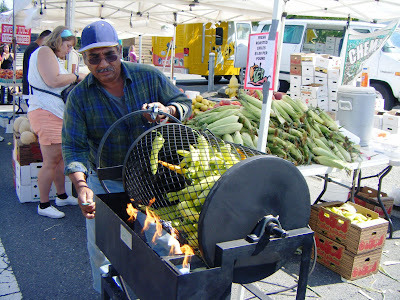 And though the Esquivel family sells produce at farmers markets throughout Greater Seattle, so far they’ve only schlepped the roaster to the Crossroads Farmers Market and to Kirkland. “The first day I only sold one pound,” said Pedro, whose roasted-pepper sales are slowly taking off. Plopping down $10, I swiftly took off with two pounds. 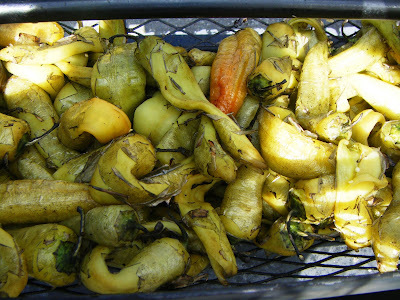 When I got them home, I removed what was left of the charred skins, tossed the mild peppers into a Ziploc bag, then asked myself: “Now, what are you going to do with them?” Anybody have any ideas?